Beach villa kamala was the very fantastic beach house in Phuket, built long before any roads crossed the island with cars. Over the last 30 years, it has been added and improved to the point it is a wonderful relaxing beach house that sits comfortably on the beach, rather than a purpose built Villa high-end on the hillside. The Villa sits directly cross the road walk to the beach and enjoys breathtaking West Coast sunset views over Kamala Bay. At high tide the water is good for snorkelling right near of the Villa out to a protected reef. The 15 meter chlorinated swimming pool right outside your lounge and the only thing opposite you and the beach – all yours to enjoy. Surrounding the pool are modern pool recliners and oversized beach towels as well as a range of seating options and the poolside. On the top level are 2 double bedrooms. And also have sofa bed in large master bedroom. All 3 bedrooms are fully air conditioned and furnished with lovely fresh linens and towels, as well as robes and slippers to relax around your Villa. The lounge opens up full width to the pool for maximum indoor/outdoor living. It has a large flat screen TV with DVD player and satellite connection to HBO, CNN, Star Sports, E, cartoon network and another 100 or so Multi language speaking channels. The fully equipped kitchen is where you meals will be prepared by our resident Chef or you are welcome to use yourself. Her speciality is Thai food, but can cook English breakfast, poolside snacks or BBQ and whip up a tasty fruit shake. Just let us know what you would like to eat and we will buy it fresh daily at the markets and charge you only what it cost us. Bottled water and cases of soft drinks of your choice in the fridge for your stay, with our compliments. And if you want specific brought and waiting for you at the Villa before you arrive, just let us know and we’ll be happy to do it for you. You can dine indoor , or you can sit at the big terrace and have the best sofa, bed, bar chair dining table and music – all in your private Villa. If you must stay connected with the office during your vacation you have a few options. 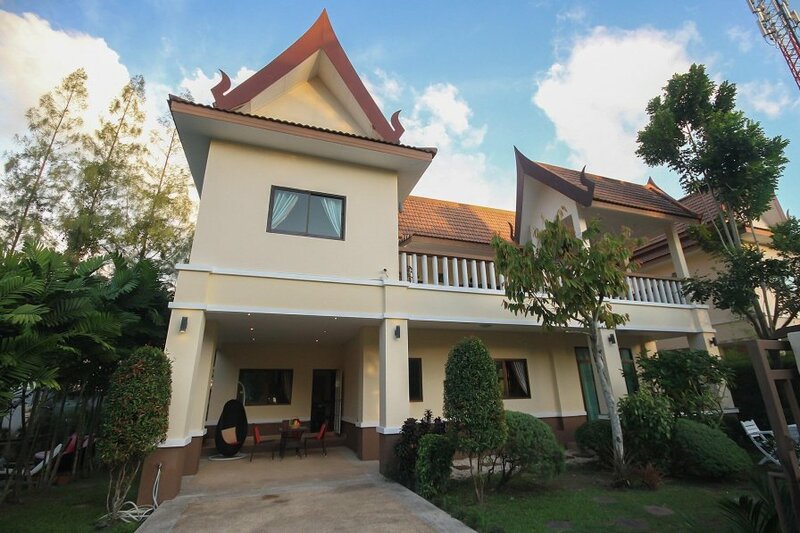 Beach Villa Kamala is one of the only Villas in Phuket to offer a complete business centre, complete with 7-seat boardroom table, laptop, and 2MB/Second Internet connection. It also has the very best views of any business centre near by the beach just 3-5 minutes walk but if you would rather sit by the pool with your laptop, the Wi-Fi extends throughout the Villa and is complimentary.